Background: The prevalence of third molar pathology and problems associated with surgical extraction of impacted third molars has been extensively discussed in the literature; however, few have discussed the pathologies that can be associated with impacted third molar tooth. Aim: The aim of the current study, therefore, is to evaluate the types of associated pathologies with impacted third molars in Sub-Saharan Africans. Materials and Methods: This is a prospective study that was conducted in the Department of Oral and Maxillofacial Surgery, Obafemi Awolowo University Teaching Hospitals Complex (OAUTHC), Ile-Ife, Osun State, Nigeria, between January and March 2012. Consented patients between ages 18 and 35 years were recruited into the study. Data were analyzed using IBM SPSS Statistics for Windows Version 20 (IBM Corp., Armonk, NY, USA). Statistical significance was set at P < 0.05. Results: A total of 135 mandibular third molar extractions was carried out during the study period from 72 (53.3%) females and 63 (46.7%) males (F:M = 1.1:1). Mesioangular impaction was the most frequent spatial relation of the impacted mandibular third molar to the lower second molar tooth (70 [51.9%]), followed by distoangular impaction (29 [21.5%]). Mesioangular impaction was mostly associated with pathology (70 [51.9%]), with a statistical significant difference of P = 0.000. Pathological pocket and caries on both impacted lower third molar and lower second molar tooth accounted for the highest number of associated pathologies (37 [27.4%]). Conclusion: Caries and pathological pockets were the most common associated pathology with impacted third molar. Impaction of third molar is a universal problem which may be on the increase. Most epidemiological studies do not distinguish between the prevalence of one, two or more impacted third molars, the figures vary with different populations worldwide. There has been much discussion in the literature regarding the prevalence of third molar pathology and extraction. Research has also shown a relationship between the presence of wisdom teeth and the progression of periodontal disease. However, few published articles have reported on mandibular third molar with their associated pathologies. Similarly, it has been shown that lack of symptoms on impacted third molars does not necessarily liken to lack of disease. Impacted third molars have been associated with pathologies which include, cystic lesions, neoplasms, pericoronitis, periodontitis, and pathological root resorption as well as injurious effects on the lower second molar teeth. The proponents of prophylactic removal of third molars have used this position of possible pathologies that can be associated with the third molar tooth as evidence for its early removal. The aim of the current study, therefore, is to evaluate the types of associated pathologies with impacted third molars in Sub-Saharan Africans and to find out if there is any relationship between age group of patients, spatial position of the third molar, indication for extraction, and associated pathologies. This is a prospective study that was conducted in the Department of Oral and Maxillofacial Surgery, Obafemi Awolowo University Teaching Hospitals Complex (OAUTHC), Ile-Ife, Osun State, Nigeria, between January and March 2012. The study population comprised of consented consecutive subjects, in the age range of 18–35 years requiring third molar extraction during the study period. This age range covers the peak age incidence of impacted mandibular third molar in the study population. Pathologies associated with impacted teeth included as follows: (1) caries of the impacted and/or adjacent second molar teeth; (2) periodontal bone loss of the adjacent tooth of >5 mm below the cement-enamel junction; and (3) root resorption of the adjacent tooth. Clinical condition of associated soft tissue with impacted third molar is difficult to record as there are no standardized criteria for its assessment. However, this study has defined chronic pericoronitis as mild inflammation of the pericoronal soft tissue related to the impacted third molar teeth. Standard periapical radiograph was used to find out the pathologies associated with the impacted mandibular third molar. To ensure diagnostic validity in this study, radiographic findings were verified with clinical records, which were collected on standard forms as part of the routine examination process. Data were analyzed using IBM SPSS Statistics for Windows Version 20 (IBM Corp., Armonk, NY, USA) and result presented as simple frequencies and descriptive statistics. Pearson's Chi-square was used to assess the association and level of significance among categorical variables such as age group of patients, spatial position of the third molar, indication for extraction and associated pathologies with P ≤ 0.05 considered as statistically significant. Approval for the study was obtained from the Ethics Committee of the OAUTHC Ile-Ife with protocol number ECR/2011/04/14, National number NHREC/27/02/2009a and International number IRB/IEC/0004553. A total of 135 mandibular third molar extractions was carried out during the study period from 72 (53.3%) females and 63 (46.7%) males (F:M = 1.1:1) [Figure 1]. The age ranged from 18 to 35 years (mean ± SD, 24.8 ± 5.0 years) with majority of the patients (43.7%) in the age group 21–25 years old [Table 1]. Ninety-eight (72.6%) patients presented with clinical symptoms in their third molar while 37 (27.4%) patients presented with symptoms associated with both the third molar and adjacent second molar teeth. The most frequent complaints were pain and swelling, which were found in 88 (65.2%) patients. Eighty-seven (64.4%) patients complained of food trapping while bleeding was reported by 79 (58.5%) patients. 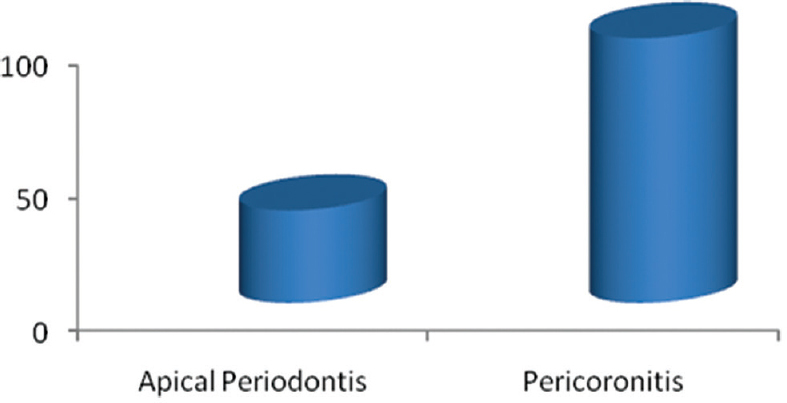 Chronic pericoronitis was the most common indication for surgical extraction of mandibular third molar (100 [74.1%] patients) in the study population followed by apical periodontitis (35 [25.9%]) [Figure 2]. Mesioangular impaction was the most frequent spatial relation of the impacted mandibular molar to the lower second molar tooth 70 (51.9%), followed by distoangular impaction 29 (21.5%), others are as shown in [Table 2]. When spatial relationship was compared with gender, most of the distoangular impaction was seen in females 20 (14.8%) patients while most of the horizontal impaction 13 (9.6%) cases were seen among the males with statistical significant difference of P = 0.028 [Table 2]. Out of the 135 patients seen, 88 patients have associated pathology while 47 patients had no pathology with a prevalence rate of 65.2%. Pathological pocket and caries on both impacted lower third molar and lower second molar tooth accounted for the highest number of associated pathologies 37 (27.4%) followed closely by pocket alone between the second and third molars 32 (23.7%). There was no significant difference when the associated pathology was compared with gender of the patient χ2 = 1.678, df = 4, P = 0.795 [Table 3]. It was observed that most of the cases without associated pathology were seen in the age groups 16–20 years and 21–25 years (12 [8.9%] and 23 [17.0%], respectively) with a statistically significant difference of P = 0.015 [Table 4]. When associated pathology was correlated with spatial relationship of the impacted third molar, mesioangular impaction was mostly associated with pathology 70 (51.9%), with a statistical significant difference of P = 0.000 [Table 5]. The literature has discussed extensively the prevalence of third molar pathology and extraction, however, less discussion has taken into account the possibility of early or occult associated pathologies with impacted third molars. Associated pathologies with third molar teeth may be clinically evident or hidden. When hidden, patients will frequently present with vague complaint such as headache, “pressure,” or pain that is not readily attributable to the teeth. Pain has been described to be commonly associated with third molars; however, vague complaints may confuse the clinician leading to misdiagnosis. It is, therefore, important that impacted third molar teeth be cautiously monitored for signs of pathology. Simsek-Kaya et al. have reported that inflammatory changes and cyst formation are common in periapical soft tissues of fully impacted nonsymptomatic third molars. Mesioangular impaction has the highest frequency of associated pathology in the present study with P = 0.000. This finding has been reported by Khawaja et al. in Saudi Arabian population. This is so because the space created between the mesioangularly impacted mandibular third molar against the second molar teeth forms plaque accumulated crevices leading to food and debris packing resulting in stagnation area for bacterial growth. Distoangular impaction has the least frequency of associated pathology in the present study. It stands to reason that since there is no contact point between the crowns of distoangularly impacted third molar and the second molar tooth, there will be no stagnation area for bacterial proliferation. Pericoronitis which is an inflammation of the soft tissue overlying partially erupted third molar is common in vertical impactions; however, it has also been reported to be common in mesioangular impaction. This present study showed that higher proportion of pericoronitis is related to mesioangular impaction as seen in 70 (51.8%) patients, closely followed by distoangular impaction in 29 (21.5%) patients. We also observed from this study that pericoronitis has the highest frequency of associated pathology with the impacted mandibular third molar, we opined that the extra bacterial load beneath the soft tissue in addition to those in the pathological pockets could be responsible. Mansfield et al. have reported that in cases of acute or chronic pericoronitis, soft tissues around the impacted third molar could provide a base for the establishment of periodontal problems in other intraoral sites. Caries and pathological pockets were the most common associated pathology with impacted third molar and adjacent second molar teeth. Clinicians should incorporate periodontal probing into the examination of the third molar for the documentation of possible associated pathology with impacted third molar teeth so as to give patients information on whether to retain or extract asymptomatic impacted third molar teeth. The authors wish to acknowledge the clinical and administrative staffs of the Department of Oral and Maxillofacial Surgery, Obafemi Awolowo University Teaching Hospital, Ile-Ife, Osun State, Nigeria. for their assistance during the study. Owotade FJ. Current concepts in the management of impacted third molars. Niger J Med 1999;8:135-8. Faculty of Dental Surgery. Current Clinical Practice and Parameters of Care. The Management of Patient with Third Molar Teeth: Royal College of Surgeons. Faculty of Dental Surgery; September, 1997. Obiechina AE, Arotiba JT, Fasola AO. Third molar impaction: Evaluation of the symptoms and pattern of impaction of mandibular third molar teeth in Nigerians. Odontostomatol Trop 2001;24:22-5. White RP Jr., Offenbacher S, Blakey GH, Haug RH, Jacks MT, Nance PE, et al. Chronic oral inflammation and the progression of periodontal pathology in the third molar region. J Oral Maxillofac Surg 2006;64:880-5. White RP Jr., Proffit WR. Evaluation and management of asymptomatic third molars: Lack of symptoms does not equate to lack of pathology. Am J Orthod Dentofacial Orthop 2011;140:10-6. Khawaja NA, Khalil H, Parveen K, Al-Mutiri A, Al-Mutiri S, Al-Saawi A, et al. Aretrospective radiographic survey of pathology associated with impacted third molars among patients seen in oral &amp; maxillofacial surgery clinic of college of dentistry, Riyadh. J Int Oral Health 2015;7:13-7. Otuyemi OD, Ugboko VI, Ndukwe KC, Adekoya-Sofowora CA. Eruption times of third molars in young rural Nigerians. Int Dent J 1997;47:266-70. Chu FC, Li TK, Lui VK, Newsome PR, Chow RL, Cheung LK, et al. Prevalence of impacted teeth and associated pathologies – A radiographic study of the Hong Kong Chinese population. Hong Kong Med J 2003;9:158-63. Samsudin AR, Mason DA. Symptoms from impacted wisdom teeth. Br J Oral Maxillofac Surg 1994;32:380-3. Gisakis IG, Palamidakis FD, Farmakis ET, Kamberos G, Kamberos S. Prevalence of impacted teeth in a Greek population. J Investig Clin Dent 2011;2:102-9. Shetty DC. Epidemiological status of 3rd molars-their clinical implications. J Oral Health Commun Dent 2010;4:12-5. Breik O, Grubor D. The incidence of mandibular third molar impactions in different skeletal face types. Aust Dent J 2008;53:320-4. Hashemipour MA, Tahmasbi-Arashlow M, Fahimi-Hanzaei F. Incidence of impacted mandibular and maxillary third molars: A radiographic study in a Southeast Iran population. Med Oral Patol Oral Cir Bucal 2013;18:e140-5. Haddad AJ, Talwar RM, Clokie CM. The Importance of recognizing pathology associated with retained third molars. J Can Dent Assoc 2006;72:41-5. Ma'aita J, Alwrikat A. Is the mandibular third molar a risk factor for mandibular angle fracture? Oral Surg Oral Med Oral Pathol Oral Radiol Endod 2000;89:143-6. Kaya GS, Aslan M, Ömezli MM, Dayi E. Some morphological features related to mandibular third molar impaction. J Clin Exp Dent 2010;2:12-7. Hattab FN, Rawashdeh MA, Fahmy MS. Impaction status of third molars in Jordanian students. Oral Surg Oral Med Oral Pathol Oral Radiol Endod 1995;79:24-9. Stanley HR, Alattar M, Collett WK, Stringfellow HR Jr., Spiegel EH. Pathological sequelae of “neglected” impacted third molars. J Oral Pathol 1988;17:113-7. Blakey GH, Marciani RD, Haug RH, Phillips C, Offenbacher S, Pabla T, et al. Periodontal pathology associated with asymptomatic third molars. J Oral Maxillofac Surg 2002;60:1227-33. Mansfield JM, Campbell JH, Bhandari AR, Jesionowski AM, Vickerman MM. Molecular analysis of 16S rRNA genes identifies potentially periodontal pathogenic bacteria and archaea in the plaque of partially erupted third molars. J Oral Maxillofac Surg 2012;70:1507-140. White RP Jr., Madianos PN, Offenbacher S, Phillips C, Blakey GH, Haug RH, et al. Microbial complexes detected in the second/third molar region in patients with asymptomatic third molars. J Oral Maxillofac Surg 2002;60:1234-40. Ahmad N, Gelesko S, Shugars D, White RP Jr., Blakey G, Haug RH, et al. Caries experience and periodontal pathology in erupting third molars. J Oral Maxillofac Surg 2008;66:948-53. Ventä I, Meurman JH, Murtomaa H, Turtola L. Effect of erupting third molars on dental caries and gingival health in Finnish students. Caries Res 1993;27:438-43. Nitzan D, Keren T, Marmary Y. Does an impacted tooth cause root resorption of the adjacent one? Oral Surg Oral Med Oral Pathol 1981;51:221-4. Kahl B, Gerlach KL, Hilgers RD. A long-term, follow-up, radiographic evaluation of asymptomatic impacted third molars in orthodontically treated patients. Int J Oral Maxillofac Surg 1994;23:279-85. Sewerin I, von Wowern N. A radiographic four-year follow-up study of asymptomatic mandibular third molars in young adults. Int Dent J 1990;40:24-30. Ahlqwist M, Gröndahl HG. Prevalence of impacted teeth and associated pathology in middle-aged and older Swedish women. Community Dent Oral Epidemiol 1991;19:116-9. Yildirim G, Ataoǧlu H, Mihmanli A, Kiziloǧlu D, Avunduk MC. Pathologic changes in soft tissues associated with asymptomatic impacted third molars. Oral Surg Oral Med Oral Pathol Oral Radiol Endod 2008;106:14-8. Yamaoka M, Furusawa K, Yamamoto M. Influence of adjacent teeth on impacted third molars in the upper and lower jaws. Aust Dent J 1995;40:233-5. Güngörmüs M. Pathologic status and changes in mandibular third molar position during orthodontic treatment. J Contemp Dent Pract 2002;3:11-22.